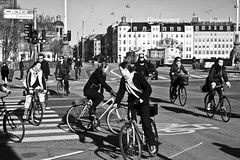 I've called Copenhagen and Amsterdam the Romulus and Remus of modern urban bicycle culture before. Another analogy applies to Denmark and Holland. 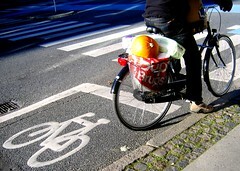 These two countries are, in many ways, the Galapagos Islands of modern Bicycle Culture. We're different species of Darwin's Finch, yet we both love to fly on human-powered wheels. These two countries and the main city in each have evolved in each their own way over the past thirty or forty years. Many of the details are interesting anthropological observations that would probably be difficult to trace to the root. Here are some of them. 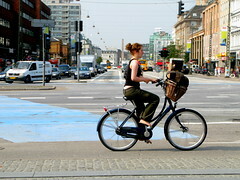 Very generally, pannier bags are used in Holland whereas front baskets are the norm in Denmark, usually wicker. This is all very general, of course, but often when the Dutch do have a basket it's a sturdy plastic crate. And you do see pannier containers in Denmark, too. We all agree that carrying stuff on a bike is paramount, but it's fascinating to see how these two standard forms developed. 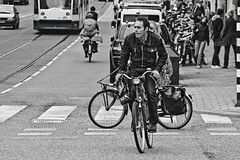 Doubling on a bike in Holland involves sitting side saddle as a rule whereas in Denmark it's the straddle that is the norm. Personally I don't know which one I prefer, as a passenger. They both have their qualities. But again, two Galapagos Islands worked out different norms. Both countries, however, are known to be creative in passenger transport when need be. When it comes to cargo bikes, the Dutch have a tradition of two wheelers. 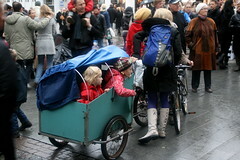 In Denmark the average cargo bike has three-wheels. Fascinating to speculate as to why that is, from a modern historical and anthropological point of view. Especially considering the fact that 60 years ago, the type of cargo bikes on the streets were much the same. Bike theft is a big problem in both countries. 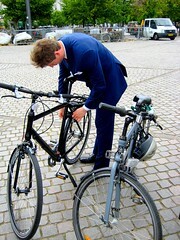 In Amsterdam a heavy chain lock is a must when locking your bike. In Copenhagen, the basic wheel lock is the way to go. Again, exceptions exist like this blue cargo bike in Amsterdam on the left and the two-wheeler in Copenhagen on the right. Now it's safe to say that the similarities between our parallel bicycle cultures far outnumber the differences. Like Darwin's Finch we are all birds that love to fly and we act and live like the same kind of bird. I love, however, these details of the evolution of bicycle culture and could spend far too much time speculating as why they are different a mere 650 km to the south. If you have any other anthropological observations, dear reader, please add them in the comments. It is a similar thing with the way that our infrastructure has developed. Decades of slow, steady development has resulted in similar solutions but also a number of different variations. Study trips are something of a more modern development in city planning. There was contact between Dutch and Danish planners over the past decades but not as much as today. Now we see Danes travelling to Holland and the Dutch travelling to Denmark. We all travel to Germany and Japan and beyond to learn from their innovations and solutions. Raising one nation's solutions above others is folly. Imagine if there were actually people who spent time trying to do that! What we all have today is the result of countless traffic planners work over several decades in a wide geographical area. There are many instances of common Best Practices, just as there are many instances of solutions that are unique to one country or even one city or region. Those from abroad who come shopping for bicycle infrastructure models and/or inspiration often visit both Holland and Denmark. There are excellent examples of small city solutions in both countries. For larger cities, both Amsterdam and Copenhagen are goldmines of inspiration and innovative solutions. Personally, I prefer cycling around Amsterdam. I love the organic flow of bicycles in the city. Amsterdam is so wonderfully unique. I have written before that the city is perhaps too unique. I don't believe that we will see a new Amsterdam emerge in my lifetime. The whole layout of the city is so specific to Amsterdam that is often hard to translate what you see there to other cities. What I hear from the traffic planners who visit us in Copenhagen is that they can stand in this city and envision their own city at the same time. There is an old historic city centre, sure, but the broad boulevards, the motorways and the urban sprawl [3rd largest in Europe] with the accompanying public transport network - all integrated with bicycle infrstructure - can all serve to resemble other cities on distant continents if you squint a bit. To be honest, I wish every city could be like the city centre in Amsterdam but it seems that most larger cities are working towards a Copenhagenize solution. Small provincial cities have it easier. 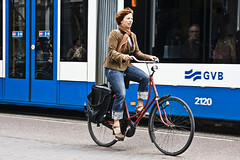 There are many examples of smaller cities moving quickly towards reestablishing the bicycle as an accepted and respected form of transport on their streets, in France, Sweden, Germany, Spain, Italy and abroad. Large urban centres are trickier. You need more dumplings in the soup, as the old Danish saying goes. The challenges are greater. Fortunately, if you look at both Denmark and Holland, Copenhagen and Amsterdam [not to forget dozens of Japanese cities], the sources of inspiration are many. Whatever the case, one thing is certain. Wherever you go you'll see a ballet of human-powered movement. The melody may be slightly different, the lyrics altered somewhat, but you'll be able to hum along and tap your foot to the orchestra of bicycles.